Elvis Presley, The King, was notorious for two things, music and a sandwich. While everyone is familiar with his music, not everyone would agree with his choices of food decisions, rich and greasy. We are! 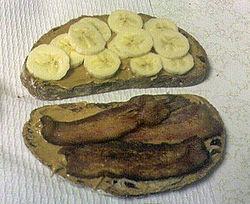 "THE ELVIS", a sandwich made with peanut butter and bananas, and most times bacon. Here is where we appreciate his decisions. Bacon was fried in a pan until crispy. The bacon was then removed, however, the grease was kept in the pan. After spreading peanut butter throughout two slices of bread, they were then placed in the bacon greased pan, peanut butter faced up. While still crisping in the pan, add banana coins to one side, or both. Don't forget the bacon as well. Once toasted, complete the sandwich in the pan. Give it one last flip before removing this masterpiece. We couldn't help but create our own version of this sandwich in candy form. We call her Presley. She is filled with caramelized bananas and peanut butter. Obviously our shell is crispy bacon. We hand dip her in milk chocolate and top it off with peanut pieces and banana chip pieces. She is available in our SHOP. Don't forget to follow us on IG (The_Sticky_Pig) and Facebook (The Sticky Pig)!